Co. Mayo: Aughamore (2), Bohola, Kilbeagh (3), Killasser (2), Killeaden (2), Kilmoree (2), Knock, Meelick, Swineford (2), Toomore. 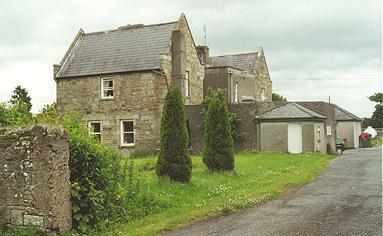 Co. Mayo and Co. Sligo: Kilmacteigue (2). The Board also included 7 ex officio Guardians, making a total of 28. The Guardians met each week at 11am on Tuesday. The population falling within the Union at the 1831 census had been 65,965 with divisions ranging in size from Knock (population 3,036) to Kilbeagh (8,639). The new workhouse, built in 1840-42, occupied a 6-acre site on the southern side of Barrack Street to the east of the town. It was designed to hold 700 inmates and its construction cost £7,100 plus £1,300 for fixtures and fittings etc. It was declared fit for the admission of paupers on 30th November 1842 but did not admit its first inmates until 14th April 1846. Swineford entrance from the north, 2000. 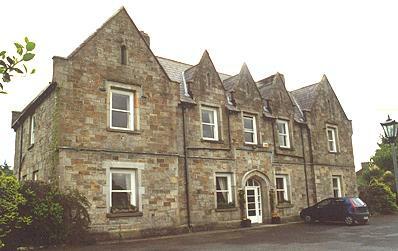 Swineford entrance block from the north-east, 2000. Swineford workhouse entrance block from the west, 2000. 120 were admitted beyond the regulated number. Hundreds were refused admission for want of room, some unhappy being pushed on the high roads and in the fields. Influenced by terror and dismay — leaving entire districts almost deserted — the better class of farmers, in numbers, sold their property, at any sacrifice, and took flight to America. And the humbler classes left the country in masses, hoping to find a happier doom in any other region. In this Union, 367 persons died in the workhouse; the Master of the workhouse also died. 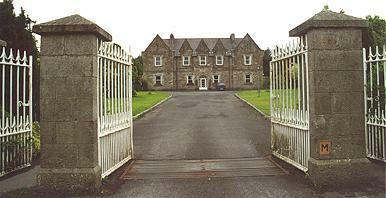 In the adjoining Union, Ballina, 200 were admitted to the workhouse beyond the number it was built for (1,200). Hundreds were refused admission for want of room and 1,138 died in the workhouse; the medical officer of the workhouse was also carried off. In another adjoining Union, Ballinasloe, all the officers of the workhouse were swept away, and 254 inmates of the workhouse perished. The following year, sometimes referred to as "Black '47", diseases such as typhus and dysentery took hold in the workhouse, and six hundred bodies were buried in a mass grave. I beg to state for the information of the Poor Law Commissioners, that the poor starving people of this electoral Shrule division are almost neglected by the Vice-Guardians of this Union. About three or four-hundred of the most destitute families of this division have crawled to Ballinrobe (a distance of 10 or 12 miles), every Friday for the last month, seeking admission to the workhouse or out-door relief. This I can certify, for I have accompanied the poor creatures thither in order to represent their wants to the Guardians; and yet, though they remained each day until night, standing in wet and cold at the workhouse door, craving for admission into the house, they have got no relief and I do now most solemnly assure you that, but for a few shillings which I used to distribute to buy bread to enable their poor families to return home very many of them would have died by the road-side whilst returning from Ballinrobe. Six poor creatures who have been dragged to Ballinrobe in this manner, have died in this electoral division this week, and I am greatly afraid that treble that number will meet the same awful death before this day week. In 1879-81, Ireland suffered another agricultural crisis, with bad weather and poor harvests leading to food shortages and unemployment, with the west of Ireland being particularly afflicted. The British government instigated an ineffectual scheme to fund public works schemes via loans to land-owners. However, the main source of relief during the winter of 1879-80 came from voluntary and charitable organisations, with many Boards of Guardians restricting out-relief either as a matter of policy or because of lack of funds to pay for it. In the summer of 1880, the Local Government Board dissolved the Swineford Board of Guardians (and also those of the nearby Newport and Belmullet unions) for failing to collect sufficient rates to provide relief. The LGB then installed its own vice-guardians to try and restore the union to financial order. At the 1901 census, the population of the Union was 44,162. 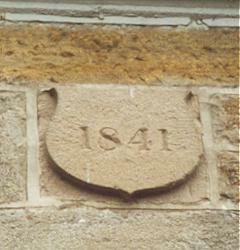 Today, the entrance block to the workhouse survives and is used for geriatric care. One of the Swineford workhouse's most notable inmates was Michael Davitt, a native of Straide Co. Mayo. In 1850, at the age of four-and-a half, Davitt entered the workhouse for a short time with his destitute mother due to arrears in their rent. 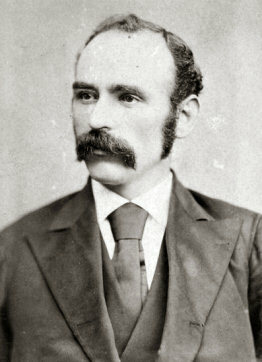 In the 1880s, Davitt was a founder and also chairman of the Land League, a prominent agrarian protest organization in Ireland. He later entered Parliament, and was an eminent socialist campaigner, writer, and lecturer, his views undoubtedly owing much to his childhood penury, including his time as an inmate at Swinford. Hamrock, I (1998) The Famine in Mayo 1845-1850 .